I was lucky enough to get my hands on the new GoPro Fusion 360 Camera last month and have been shooting some fun footage with it of late. 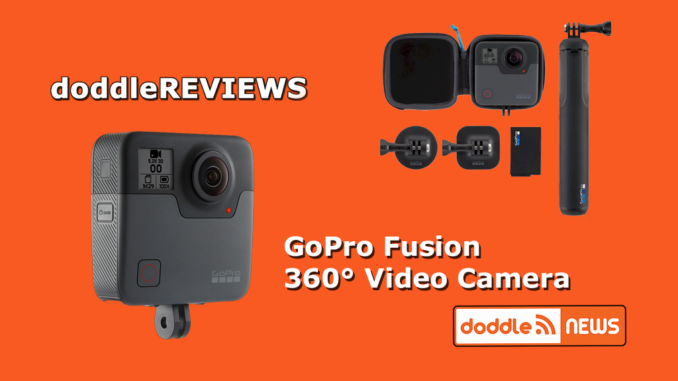 As mentioned in our announcement article from GoPro’s San Francisco live event, the GoPro Fusion is the company’s third 360 degree video capture device design, and it’s been streamlined to make it easier for everyone to use. 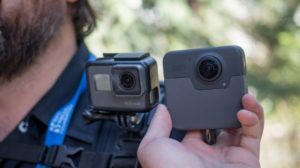 Sporting two aspherical cameras that capture 5.2K video in the round, or 18mp spherical photos, the Fusion is about 2”x2”x1″. So it’s very compact. 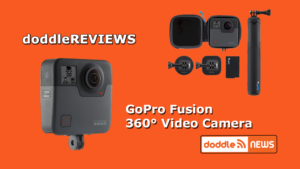 It comes with the Fusion Grip Mount, which is a telescoping tripod and GoPro mounting adapter, so it can be handheld or placed on the ground for recording. The battery for fusion is huge, but thin. About twice as large as the standard GoPro camera, which makes sense, it’s powering two cameras at once. And the battery life is pretty good. Fusion is charged by a USB-C cable, which is included as well. One thing here to be very careful of, though. The battery fits in between the two microUSB card slots that the camera writes files to. And it’s very easy to slip a card into the battery compartment when you think you’ve got it seated into the SD card slot. If that happens, just remove the battery and you can retrieve it and try again. Performance wise, the camera as easy to use as the GoPro HERO6. Maybe even easier. All you do is hit the red shutter button in the front, and it turns on and begins recording in the round. You can also press the mode button on the left side to shuttle through the various GoPro menu options, which should be very familiar to HERO users. 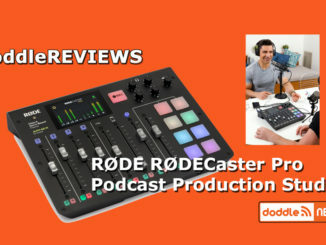 But while the camera itself is a pleasing experience to record with, it’s when you begin the post production workflow that things get extremely frustrating. The choices here are to transfer the stitched footage to the GoPro App, or upload to GoPro’s desktop Fusion software. And that’s where the problems begin. 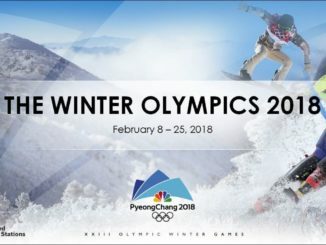 First, let’s look at the GoPro Mobile app itself, since being outside capturing the actions lends itself to using the mobile option for a fast sharing to YouTube and Facebook. Here is possibly the first hiccup If you’re capturing longer than 30 seconds for Facebook or 90 seconds for YouTube, the GoPro app can’t help you since those are the limits that GoPro seems to have placed. 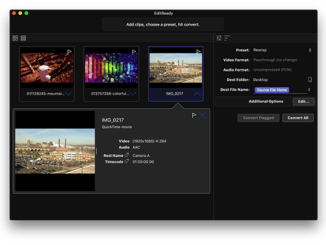 Vimeo is also an option in the Fusion Studio Desktop app. In addition, when sharing to YouTube, the app seems to lag a lot when uploading in 4K. So much so that I couldn’t even type the title and I had to upload it untitled to get something up. I figured I could make those changes later. This was probably due to my clip being 4 minutes long, even though I was cutting it down to a minute and a half. When I worked on a clip that was half that length, it was a lot more snappier. And I have a hunch that’s due to me using an iPhone 6S Plus, so if you have a newer mobile device, you could have better luck. Keep the clips shorter and you’re likely going to have a lot less frustration. I had hoped that I could save the files to my camera roll and then move them onto my desktop. No such luck. There’s no way to do it. GoPro keeps the files sandboxed and all you can do is share to facebook or YouTube. Or wwatch with the GoPro app itself. But if GoPro is going to do that, they should at least make it easier to move them over the desktop. But I’m getting ahead of myself. So I went with a single file and it seemed to work better. The interface is overly simple. You have a choice to access the media from the camera directly via USB-C, or move it over to your desktop and then find it that way. But that didn’t work for me, so I went back to connecting the camera directly. When I connected, it said that “one camera LRV file list is empty.” So I backed out, went back in, and it found the file was OK to continue. I did a render. Later, though, I went back in and it popped up again. Now I can’t do anything. So I’m not really sure what’s going on there. When I rendered a single file, it didn’t crash at all. So one file at a time, I guess. Or maybe multiple files that are a lot smaller than the 4 minute clip I created. But it did bog down my system, which has no shortage of RAM. And it took a LONG time to process even the shortest 90 second clip from that file. Not surprising since the video file is 5.2K and it as to stitch and then edit. But even then, a shorter render failed! I even had it set to render out at the lowest youtube setting of 2K and stereo sound, but that didn’t help ease the load. Still, once it finished rendering, it has gone back to the main screen with the choice of gathering your files again, or finding them through the ADD Media option. Click on that, and there’s NOTHING there. I honestly think that Fusion Studio is a bit buggy and hopefully, an update will solve all these problems. But to be fair, I’m not a serious 360 video guy either. So I may be doing something wrong in trying to import all the media files. Either way, though, you can at least watch those on your mobile phone, or shorter clips uploaded to Facebook or YouTube through the app. Oh and if you’re thinking of GoPro Quik to solve the problem? It doesn’t support 360 files yet. So that only leaves the promised plugins for Adobe Premiere. Fortunately, when you download that app, those plugins will download with it. 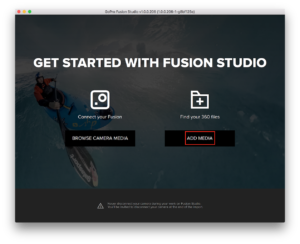 So if you’ve been doing 360 work inside Premiere, the plugins should make it easier to work with Fusion. For me, though, my experience is that GoPro Fusion is all dressed up and no real place to go outside of the mobile app itself, where it really shines. You can publish small 30-90 second video files on the fly with your mobile phone. You just can’t do much with them other than that. At least I couldn’t. I’ve seen the demos, so I’m sure a practiced hand can manipulate the interface better than I can. 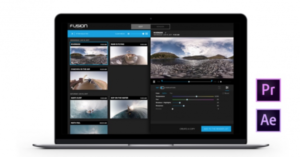 But if you’re an average GoPro user looking to experiment with Fusion on the desktop, you’re more likely going to have a similar frustrating experience. Update: The GoPro app Overcapture update has dropped and it’s fantastic, but limited. It’s really easy to use in that you take your 360 footage, select where you want the Overcapture clip to start and then move to the end point in the space and select it again. All on your mobile device. Then the Quik app processes a separate 1080p clip and bob’s your uncle. It’s really fast, though I rather felt the quality wasn’t as good as it may be through the Fusion Desktop app. It’s limited to about 90 seconds, which is actually a long time if you sit and count it. I don’t think you’d need anything close to that, trying to get a 2D clip to edit with, so it’s OK.
Is Fusion worth buying? Well, only if you’re seriously into 360 video, which I am not. 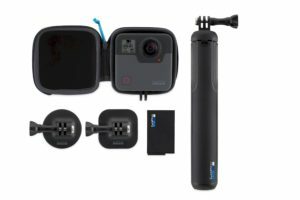 I will say that out of the 360 cameras that are on the market, Fusion is by far the best of the bunch, and for the price, it’s a great way to get into the genre.